A review copy of this book was provided by Allen & Unwin. 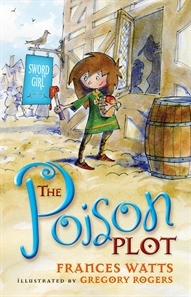 The Poison Plot is an action-packed medieval adventure. There are black and white illustrations every few pages and they add to the fun—you might recognise Gregory Rogers’ style from his books The Boy, The Bear, The Baron, The Bard and The Hero of Little Street. Tommy is a brave, clever character who outsmarts bullies and makes friends with the castle’s animals. We love the poor crocodiddle with the cold, and, of course, the castle cat from the first book in the series. A funny, fast-paced early chapter book.